We are starting a new series called CC’s Sunday Favorites and today is our inaugural post! OK, now I’m feeling guilty because it’s called CC and Mike, I mean…why doesn’t Mike Miller get a weekly favorites post? Maybe I’ll ask him to do a post or series in the future but let’s be honest, it would mainly consist of power tools and Patagonia vests and boots and maybe some baseball equipment, so there probably wouldn’t be much content there. Let’s just stick to CC’s Sunday Favorites for now, shall we?! We will give Mike his day to choose his favorites another time, I promise. Every Sunday, I am going to share some steals and deals and just favorite fashion, beauty, and home decor items that I’m loving. Some of these items will be from CC and Mike THE SHOP as we will be highlighting new products and inventory that I’m drooling over, and some will just be from good old Target and anywhere else. So come along as I share this week’s favorites with you guys. It’s all about Spring you guys and as always, I’m loving leopard anything and everything, blush and denim pillows, faux agave and olive plants from Target, oh and speaking of Target…I’m obsessed with my new sunglasses, black hat, and leopard shirt from Target so those are definitely making the CC’s Sunday favorite lists. First of all, I’m going to give you my TOP 3 items that I’m loving for this week. #1 – Topping the list for this week are my new Spring and Summer sandals I got from Sole Society. The Audrina espadrilles in leopard are TO. DIE. FOR. You guys, just buy them and thank me later. I mean you can do anything with these beauties. You can dress them up and wear them with a LBD. Or, you can throw them on with cut offs and a t shirt and they instantly make your outfit! #2 – Next up, are my new Target Sunglasses. I wore these in an Instagram story on Friday and people were blowing up my DM’s asking where they were from. I mean, Target for $16 y’all. You can’t beat that. And if you lose sunglasses like I do, you appreciate a good, trendy $15 pair of sunglasses. I’ve just learned I can’t invest in really expensive sunglasses because I have a tendency to scratch and lose them. So…let’s just say I’m a really big fan of cute, affordable sunglasses like these. #3 – The Skye Berry rug from CC and Mike the Shop. You guys, I ordered this rug sample two weeks ago and once it came in I was in love. It’s the perfect mixture of blush and a darker berry tone mixed with gray and even a dark navy. 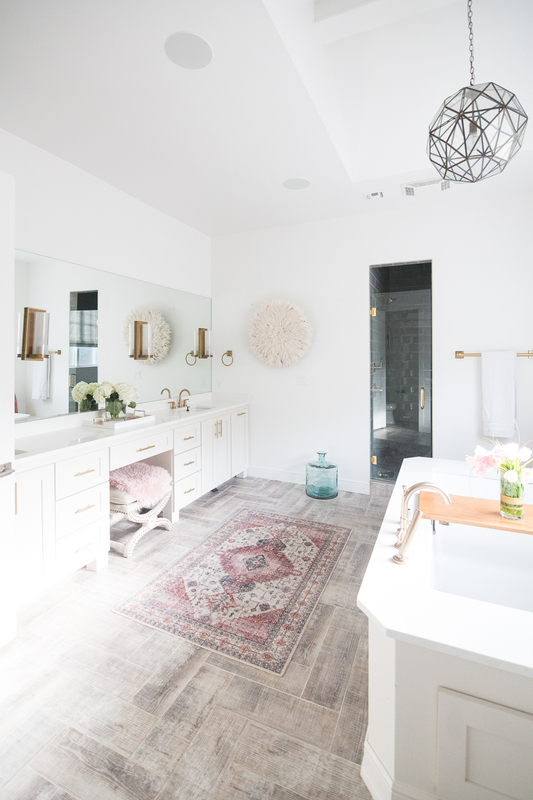 It can be used as a runner in kitchens, in bathrooms (as you will see pictured below in our bathroom), or even as a large area rug in bedrooms and living rooms. It’s a beauty, AND it’s affordable. I highly recommend this rug for anywhere in your home. Don’t forget to grab your SKYE BERRY RUG from CC and Mike the SHOP! It makes a gorgeous kitchen runner too!! Sea and Moon Kimono – I love how versatile a kimono can be, especially this colorful one! It can be worn with jeans, shorts or even used as a cover up. 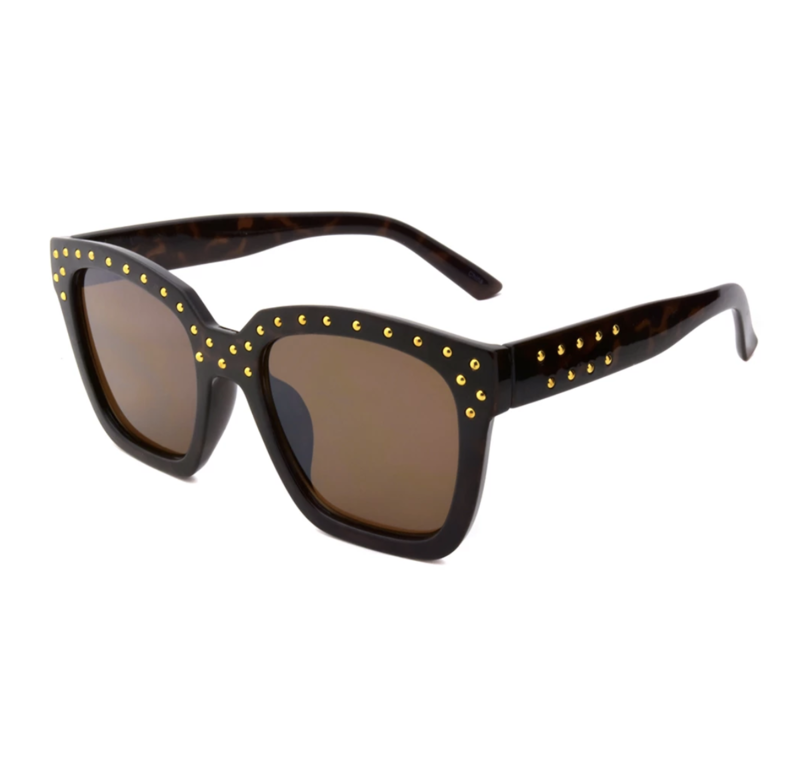 A New Day Tort Sunglasses – These sunnies are giving off total 70s vibes, which I’m all about! They are also very affordable for the every day fashionista that likes to switch it up. Black Panama Hat – If y’all follow me on the gram, I’m sure you’ve seen me sporting this hat a lot. It’s such a staple that I have to have in my closet. Black Striped Cover Up Dress – I love this effortless look when it comes to swimsuit cover ups! With a pool in our backyard and spending a lot of time out there, this will be my go-to for this summer. Black Scalloped One Piece – Y’all this has to be one of my favorite one piece swimsuits! It’s sophisticated with the one shoulder and scalloped edges, and the quality speaks for itself. Patchwork Denim Jacket – You can’t go wrong with this patchwork denim jacket. It’s super comfortable and a spin on the classic denim jacket. I’ll be wearing this all spring with sundresses and white skinnies! Cross-neck open back romper – Loving this retro striped romper! It’s going to be a great summer outfit to throw on for barbecues or a girl’s night out with a pair of espadrilles! Striped Pullover Hoodie – The softest hoodie to throw on post workout or running errands during the day. I love how simple and effortless it is, and I love the side slits to give off that chic look. Leopard Print Top – This is the perfect laying tee that can be worn so many ways! The elastic, ruffled cuffs and tied neckline is a great tee to have within your closet to spice things up, but still being super comfortable. I love wearing this with a jean jacket and black skinnies! Full Coverage Concealer – I cannot say how much I love this under eye concealer! I wake up, say goodbye to the dark circles, and head out the door – oh and price point you can’t beat! Flatform Espadrille – Another closet staple of mine! These are so comfortable, and can be paired with multiple outfits for the spring and summer. I’m going to be wearing mine with dresses, cropped skinnies, and jean shorts! Blush crossbody – I love this color for spring and summertime! It’s the perfect size to take with you on vacation or a night on the town. Although, the one pictured is sold out – I’ve linked up a very similar style! Natural Oval Basket – I’m calling this the catchall of baskets. You can store anything from blankets to my beloved fig tree! Ivory/ Berry Skye Rug – Love, love, love this rug! It’s the perfect combination of ivory and a dark navy that gives it that extra pop for any space in your home! See how we styled it within our home! Spiked Agave Tree – There’s nothing that makes a room complete like fresh greenery does…or faux for all those plant slayers out there like me – LOL! I love how real this looks and it lives on FOREVER! Ound Pillow – One of the latest pillows added to CC + Mike The Shop. We are loving this in our newly designed living room! BW Pom Blanket – The family is loving this gorgeous Moroccan blanket that we’ve added our living room. It’s comfortable and makes for a stylish piece to lay on top of the couch. Bend Pillow – I’ve paired this with the Ound Pillow and love how the two colors and textures go together on our light couch! Everyone will be asking about this hand dyed and sewn pillow! Wood Arm Chair Husk – I’m loving this vintage charm that you can add to your space to create a midcentury look! Y’all know I’m all about the eclectic look. French Maid Chandelier – I love this white chandelier with the gold accents and gold chain! These would look super chic above a bar or lined above a dining table.